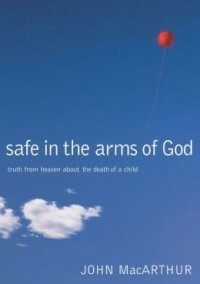 Grace to You, the ministry of renowned pastor and Bible teacher John MacArthur, is graciously giving away Hardcover copies of MacArthur’s book Safe in the Arms of God: Truth from Heaven About the Death of a Child. If you have ever wanted biblical answers for what happens in the tragic cases of the death of young children, here is an excellent resource for you. Please Note: This offer is only available for listeners in the U.S., Canada, and Europe. This FREE offer is only available through 7/27. This is the most important question a grieving parent can ask. And even if the little one is someone else’s child, the issue remains: What happens to children those unborn, stillborn, or youngsters when they die? Can you hope to see them again? Can you let go of your fear and guilt? Can God’s love soothe a wound so jagged? With scriptural authority and the warmth of a pastor’s heart, bestselling author John MacArthur examines the breadth of the entire Bible and reveals in this compelling book the Heavenly Father’s care for every life. We lost our only son at 3 days old and I also had 4 miscarriages, so I am very interested in what this book has o say. We are committed Christions and do believe he is is Heaven, but not sure about the babies we lost.